This game risked being postponed due to high winds. But it also risked being a huge disappointment. However, the game was played, and it was likely only the Cagliari fans who were disappointed. For Milan fans, to string two wins together again was an unbelievable and refreshing surprise, especially ahead of the daunting double date with Lazio next week. But for today, the match gave us reason to believe again. Reason to believe in the winds of change. The match started by conceding a goal in the eighth minute. Worse still that it was a Gigio error – normally that would have been an easy save. But Barella, Cagliari’s little darling this season, slipped it easily past our giant darling keeper to make it 1-0 Cagliari. The home fans were most appreciative of the early lead. But I hope that the Milan fans stayed sober enough to enjoy the rest of the match after conceding like that. Rather than losing momentum like usual, conceding the goal triggered an increase in effort and mentality. Maybe not enough to make anyone on the team a clinical scorer, but the intensity built instead of wilted. Cragno earned his paycheck after shots by Kessie and Kalinic. In fact Kalinic was so determined to score point blank on Cragno, Guida handed him a yellow card for his efforts. In my opinion, it was a strange interpretation of “protecting the keeper,” but he paid Kalinic back in the 34th when he was taken down in the box. There was a brief delay as the play was reviewed by VAR, but the penalty stood. And Kessie, clearly in beast mode today, stepped up and converted it calmly and confidently in the 36th. 1-1 all. But Milan didn’t stand back and rest on the laurels of a penalty given. Nor was Kessie comfortable only scoring a penalty. He and Kalinic played well together, and after a Kalinic shot was saved in the 42nd, Kalinic sent the ball back to Kessie in the 43rd and Kessie made no mistakes, he shot it straight past Cragno and into the back of the net. Again, VAR was consulted to see if the goal was offside, but the goal stood, and it was 2-1 Milan. Suso collected a very warranted yellow in the 45th, it just really wasn’t his night. But the guys went into halftime leading after having conceded first, and that was like a victory already. The second half was eventful for Guida’s match report. Seven cards. Plus the two from the first half, that was nine altogether. And two of those were second yellows, so reds. Ricardo Rodriguez saw red in the 80th, leaving Milan on ten men. But not to be outdone, Barella collected a second yellow in the 88th, so both teams ended on ten. 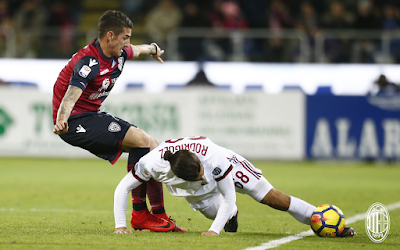 There were a whopping 23 fouls from Cagliari in the match, with a still impressive 17 from Milan. And those were just the ones that were called. There were quite a few elbows to people’s faces that were completely ignored, amongst other things. Which tells you more about this game than the score or any other stats. It was scrappy and physical. But you know what? Milan won. And at the end of the day, at the end of the season, that is all that matters. Gigo absolutely redeemed himself from his early error by making some great saves, like in the 75th. 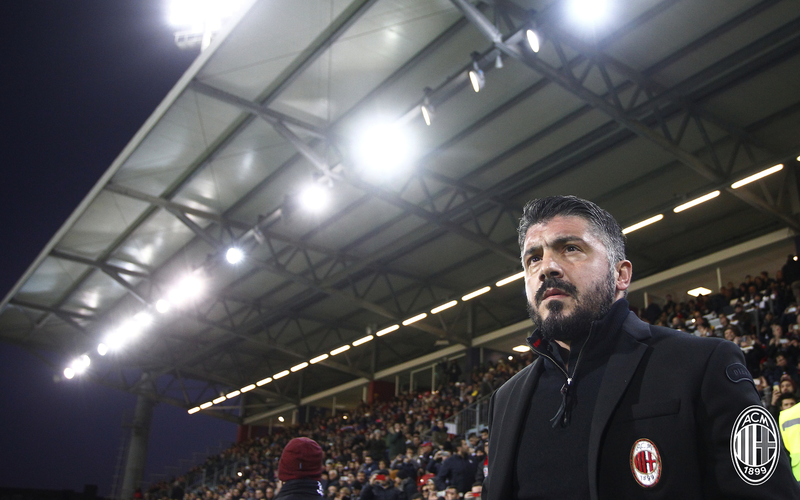 Gattuso’s subs were a bit late, but given the red card and the players he had at his disposal, I feel like they were okay. However, it was very obvious that we are still in the beginning of the rebuilding process when in the 85th, he brought on Borini, a striker who cannot score, for the young and immensely talented Kessie. Afterwards, he said Kessie was more talented than he ever was, which is quite a low bar, really, and overstating the obvious. 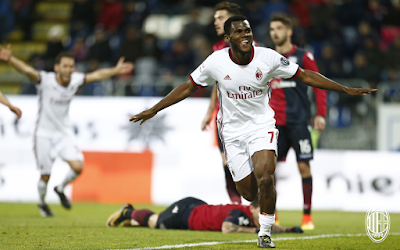 But if he can continue to inspire Kessie with his heart and passion, then he will have truly created a monster… in a very good way. The biggest disappointment to me was not seeing Andre Silva. In the press conference ahead of the trip to Sardinia, Gattuso admitted that he needed to have more courage in starting Silva from the beginning. Then we didn’t see him at all. I love Gattuso’s honesty, but that was more than gratuitous if he wasn’t actually going to take his own words to heart. To be fair, Kalinic had a great game. He drew the penalty for the first goal, albeit adding some B movie acting in there, and assisted Kessie for the second. But how do we know Silva wouldn’t have scored a hat trick? We never will, because once again he was on the bench. As windy as it was on the pitch, the winds of change are very, very far from the bench. This wasn’t a pretty game. And how much the brutal wind impacted the match, it was hard to tell. But it was a back to back win for a beleaguered team with an inexperienced and admittedly poor coach. And you cannot put a price on that. (Seriously, matchfixing is a serious crime, please do not put a price on that.) 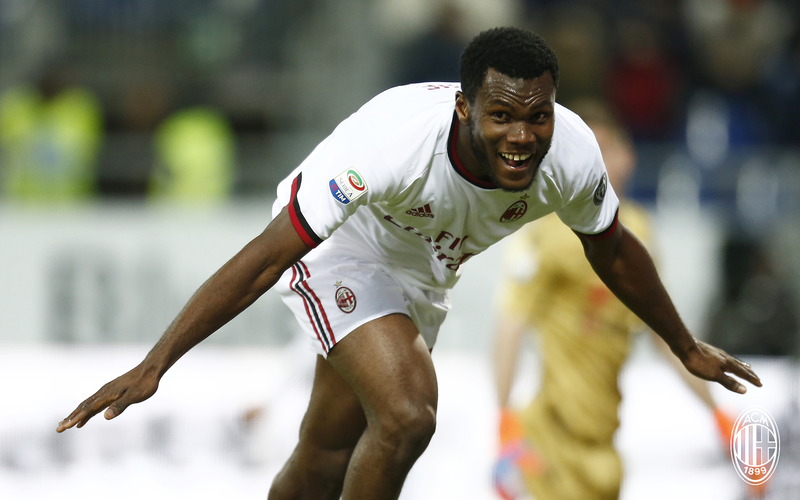 Kessie finally got the accolades for being the tireless motor of this team this entire season, and his joy was so contagious. I love that kid. I could write all day about all of the shortcomings and all of the problems in this team and this match specifically. But for now, I’m going to go to sleep and dream about the winds of change.